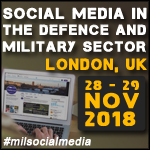 SMi Group Reports: The official agenda for 8th annual Social Media in Defence & Military Sector taking place 28th and 29th Nov 2018 in London has been released. LONDON , LONDON, UNITED KINGDOM, July 2, 2018 /EINPresswire.com/ -- After 7 successful years, SMi is proud to announce the return of the Social Media in the Defence and Military Sector conference to London, UK on the 28thand 29th November 2018. This year’s event will discuss digital military campaign effectiveness and awareness through social media, attracting a global audience of government officials, social media management software experts, academics and expert military officials. The two-day event will explore how social media has transformed into an increasingly vital tool for the Armed Forces in the 21st Century. Social media is no longer exclusively reserved for reaching out to a wider and younger audience globally for recruitment and information purposes, it has now evolved into a new front in warfare. What military servicemen post online can be crucial to winning the hearts and minds of local populations, weakening the enemy’s narrative, and can be used as an instrument in the proliferation of cyber warfare. This year's two-day conference will focus on cyber defence, operational use of social media, individual nations' and organisations' social media campaigns, open-source intelligence gathering, and much more. In addition to the two-day conference, attendees can also participate in two highly-focused, interactive pre-conference workshops on the 27th November 2018, to further expand the breadth of knowledge they will gain at this year’s event. The morning workshop will be led by Joanna Timmermann, a Director at Kinetic Thinking, who will give participants a detailed overview of “The Goal of Behavioural Change: Best Practice Thoughts for Defence Campaigns”. The afternoon workshop leader will be Captain Paddy Molloy, a press officer in the public relations branch of the Irish Defence Forces, who will discuss “The Use of Social Media in Military Recruitment”.